Nick Sandmann stands in front of Nathan Phillips in Washington on Jan. 18. We no longer live in a democracy. We live in an emocracy — where emotions rather than majorities rule and feelings matter more than reason. The stronger your feelings — the better you are at working yourself into a fit of indignation — the more influence you have. And never use words where emojis will do. Just how harmful emocracy is became clear a week ago, when the following headlines appeared: “’It was getting ugly’: Native American drummer speaks on his encounter with MAGA-hat-wearing teens.” And: “Boys in ‘Make America Great Again’ Hats Mob Native Elder at Indigenous Peoples March.” The former was in The Washington Post; the latter The New York Times. The reports were calculated to elicit a torrent of emotion. And they did. What actually happened was as follows. A group of (nearly all white) boys from Covington Catholic High School, Kentucky, were in Washington to attend a rally organized by March for Life, an antiabortion nonprofit organization. They ended up in an altercation near the Lincoln Memorial with a small group of Native Americans. One of the Native Americans, Nathan Phillips, later told reporters that he had heard the boys chant “Build that wall,” and, as an opponent of President Trump’s border wall, he had approached them to remonstrate. We now know — thanks to other eyewitnesses and a much longer video — what really happened. The Native Americans were indeed abused, but by a handful of members of the Black Hebrew Israelites, an African-American sect. It was the preacher of the Black Hebrew Israelites who directed the attention of the Native Americans at the boys. The boys did not chant “Build that wall” but responded to the abuse now being aimed at them by the Black Hebrew Israelites with good-natured school sports chants. When Phillips and a few other Native Americans marched toward them, beating drums, the boys at first joined in, dancing to the drumbeat. Only then did things get strange. 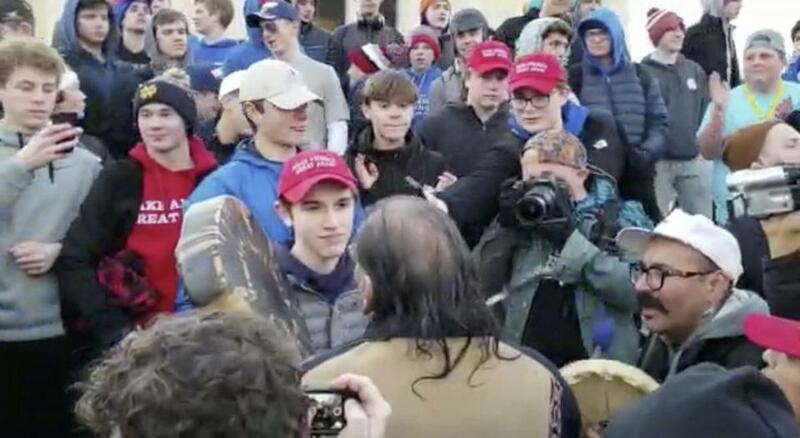 Still drumming, Phillips approached one of the boys, Nick Sandmann. Clearly uncomfortable and uncertain what to do, Sandmann froze, but Phillips went right up to him, beating the drum so close to his face that the boy was blinking. His forced smile, it is clear, was one of embarrassment, not contempt. Meanwhile, the Black Hebrew Israelites kept up their stream of abuse directed at the kids, but the boys did not respond in kind. They booed the preacher only when he used a disparaging word. With equal haste, numerous journalists offered judicious commentary. CNN’s Reza Aslan, who claims to be a scholar of religion, asked an “honest question. Have you ever seen a more punchable face than this kid’s?” By Sunday, thanks to him and other emocrats, Nick Sandmann was receiving “physical and death threats via social media, as well as hateful insults.” On Tuesday, his school was forced to close. Emocracy manifests itself in many places: on campuses, for example, where trigger warnings and safe spaces exist to protect students’ feelings, or in the #MeToo movement, where “I believe her” often trumps due process. But it is the media — both social and traditional — that have made emocracy ubiquitous. The irony is that I might never have known about it, had not the eminent scientist Richard Dawkins been in the audience. He liked it so much he tweeted it. After all the abuse I have heaped on social media in this column, you might think that makes me a hypocrite. But please note: I did not retweet the Dawkins tweet until I had done some fact-checking. The Washington Post (“Democracy dies in darkness”) and New York Times (“All the News That’s Fit to Print”) might consider trying that the next time their emotions — and their emojis — run away with them.